It's hard to believe, but it's our first year anniversary since we started this web site. This web site was on-line with the first NASH BRIDGES synopsis and commentary on Friday, March 29, 1996, the same day as the premiere of the first episode of NASH BRIDGES. To celebrate, we decided to go out to San Francisco and get some really good, close-up, candid pictures of Don Johnson. 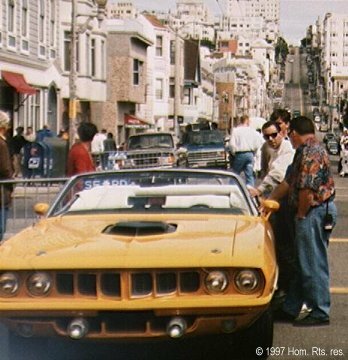 The opportunity presented itself close to the one year mark - Don Johnson was the Grand Marshal of the San Francisco Easter Parade on Sunday, March 30, 1997. The parade was scheduled to start at 2 PM on Union Street. The parade route was to run west on Union Street for six blocks from Gough Street to Steiner Street. I arrived at about 1:30 to survey the area for good photo positions. Lo and behold, there was the bright yellow 'Cuda parked at the intersection of Union and Gough. 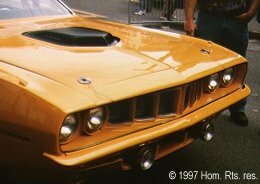 There was the security guard/driver of the 'Cuda watching over the car. 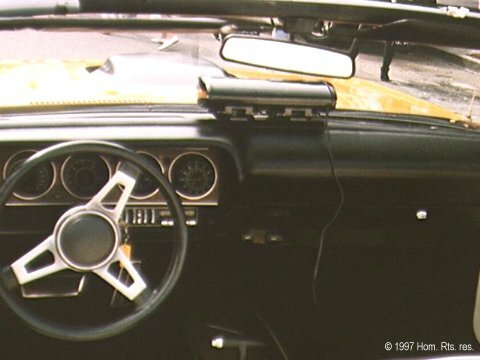 I was able to walk right up to the 'Cuda and take pictures from the driver's point of view at the wheel. A walk down Union Street revealed a vintage car gathering. The 'Cuda was to head the parade with other vintage cars in tow. Among the parked cars were a beautiful late fifties El Dorado, a Mustang, and numerous other gorgeous cars in flawless condition. There was even a vintage fire truck complete with a live Dalmatian dog on top! There were women with fancy and outrageous hats milling about from the traditional Easter hat contest. To complete the surreal atmosphere, about a dozen young people dressed in cow costumes were practicing on roller blades. The cow motif was due to the location of SF Cow Hollow area, with a larger headed Chloe the Cow mascot to follow Don Johnson.